Dell EMC is announcing worldwide availability for its next generation of the world’s bestselling server3 to help customers of all sizes fuel their IT transformation initiatives. Recently previewed at Dell EMC World 2017, the award-winning design of the new 14th generation Dell EMC PowerEdge server portfolio forms a scalable, automated and secure compute platform for traditional and cloud-native applications, designed for new Intel® Xeon® Scalable processors. “Indiaoffers a unique opportunity pertaining to the IT Infrastructure market with Digital Transformation becoming a top priority for CEOs. Data centers need to deliver a modern infrastructure that adapts and scales with business needs and ultimately enables faster IT transformation. Dell EMC’s PowerEdge 14th Generation improves upon the world’s best-selling server portfolio with performance innovations that will enable our customers to optimize their business potential,” said Manish Gupta, Senior Director & General Manager, Compute & Networking Group, Dell EMC India. 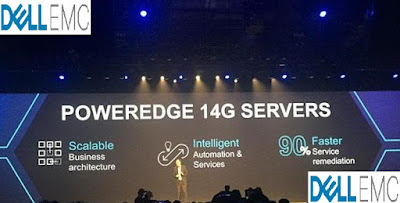 With its scalable business architecture, intelligent automation, and integrated security, the new Dell EMC PowerEdge 14th generation server portfolio delivers on these desired benefits. PowerEdge servers, the bedrock of the modern data center, enable customers to push innovation further and faster to achieve their IT transformation goals. In collaboration with Intel, Dell EMC is bringing Intel® Xeon® Scalable processors to Dell EMC PowerEdge14th generation servers. With 27 percent more CPU cores and 50 percent more memory bandwidth6, Dell EMC PowerEdge 14th generation server customers can accelerate performance of business critical applications and workloads. Dell EMC’s most advanced line-up of PowerEdge servers includes rack and blade form factors. PowerEdge servers are also the bedrock of Dell EMC solutions. Dell EMC’s industry-leading solutions and platforms also will benefit from the power and security of this new generation of PowerEdge servers. The servers will be embedded in storage and data center appliances, hyper-converged appliances and racks, hybrid cloud platforms, ready nodes, bundles, and other Dell EMC solutions. · --- Dell EMC PowerEdge R940, R740, R740xd, R640, and C6420 are now available worldwide. · --- Dell EMC PowerEdge FC640 and M640 will be available later in 2017. · --- Dell EMC solutions based on new PowerEdge servers will become available worldwide throughout the second half of 2017. Based on Dell internal analysis, June 2017. Dell EMC Engineering tested and approved a maximum of 3 NVIDIA® GPUs in the 14G R740xd server compared to 2 GPUs in 13G R730 server. The NVIDIA Tesla® M10 GPU Accelerator supports up to 64 Users per GPU board. For more information: http://images.nvidia.com/content/tesla/pdf/188359-Tesla-M10-DS-NV-Aug19-A4-fnl-Web.pdf. Dell EMC internal lab testing showed that a single R940 Oracle 12c InMemory database setup with 18-core processors performed equal or better with OLAP/TPC-H workload when compared to a R930 setup with 22-core processors. Based on cost for Oracle Database 12c Enterprise Edition using Processor License cost model as found in http://www.oracle.com/us/corporate/pricing/technology-price-list-070617.pdf . Cost calculated based on delta in CPU core counts between per-R940 and per-R930. Actual performance will vary based on configuration, usage, and manufacturing variability. Based on Dell EMC internal testing using the SAP Sales & Distribution benchmark test, June 2017. Actual performance will vary based on configuration, usage, and manufacturing variability.